Perhaps this is why plagiarism so deeply offends me: the brazenness of it, and the blasé acceptance with which our culture meets it. Did the student think I wouldn’t notice? That I was so lackadaisical a grader that I wouldn’t realize I was reading the same thing three times? Did her mother really think teaching her daughter she can claim the work of others with impunity was good parenting? Is this the truth we are left with, that you can lie, and cheat, and steal, and still “turn out fine”? That student’s mother wouldn’t like Three-Martini Lunch. I doubt someone who cares so little about academic integrity spends much time reading, and furthermore, a person who can’t grasp the wrongness of stealing something as abstract as words won’t find the book’s central conflict terribly compelling. 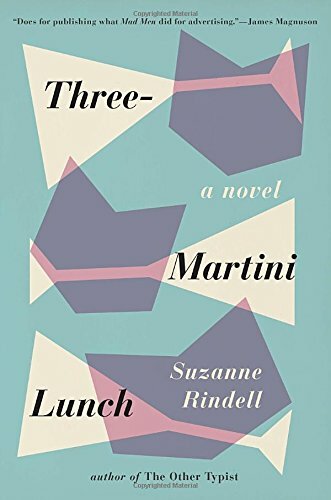 Rindell sets her sophomore novel in the high-stakes world of 1950s publishing houses, a world her characters are desperate to break into, each in his own way. Some more desperate than others. I don’t want to give too much away here. My reading experience felt like a breathless sprint around continuous blind corners, and I would hate to rob anyone of that. I will say that Rindell’s writing is, for me, the perfect balance of plot momentum and character development. All three characters who take turns narrating became 100% real to me, and somehow Rindell is able to achieve that without ever slowing her pace. I don’t know how the hell she does it. If I did, I’d bottle that secret sauce and sell it to novelists everywhere for $4.99 a pop. With regards to GP Putnam’s Sons and NetGalley for the advance copy. On sale April 5! My husband Adam is the king of long audio books. He’s listened to some doorstoppers in his time, loading up the 6-CD changer in his car and listening on his daily commute. In that fashion, he’s read Doris Kearns Goodwin’s thousand-page Team of Rivals about Lincoln’s rise to the presidency, an apparently quite thorough biography of Albert Einstein, and at least a couple of Bill Bryson’s travelogues. I always knew what he was listening to, as he’d pepper our conversations with tidbits gleaned from his audio adventures. So when I decided recently to add audio books to my reading repertoire, I remembered Adam’s success with long books and figured I could do that too. 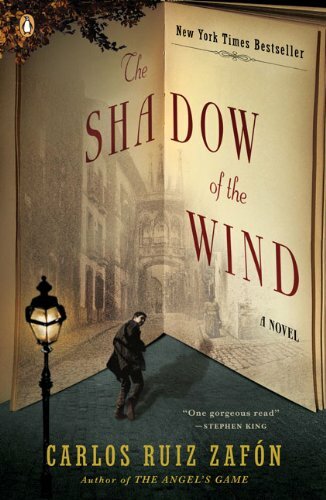 The Shadow of the Wind seemed like a safe choice: it’s about book lovers, and it came highly recommended by several of my friends. So what if it was almost 500 pages? How many hours is that, anyway? The answer: A LOT OF HOURS. If a story doesn’t have momentum to burn, I can’t stick with it in audio. No matter how skilled the reader, no matter how fascinating the characters, if there isn’t a strong sense of forward movement, I will stall out. And this book bogged down HARD for me in the last quarter. The beginning had me gripped: Daniel Sempere is given a rare book as a child. He becomes fascinated with its mysterious author, Julian Carax, when he discovers that someone has been going around collecting all the copies of Carax’s novels and burning them. Why would someone want to do this? Who was Carax anyway, and where is he now? Daniel’s efforts to find out lead him on many a death-defying adventure. Unfortunately, the revelations are so slow in coming they flirt with tedium. And it seems an ill-advised choice that the bulk of the long-sought answers come by way of a passive info-dump instead of sprouting up naturally in the course of active scenes. For about the last three hours or so, I was so ready for the book to be done (and for the overemotional handwringing to end) I almost didn’t care what happened anymore. Maybe this is one that would have worked better on the page—though it’s hard to imagine that, knowing I would have missed out on Davis’s skilled evocation of the streets of Barcelona.